Shawls serve many functions in Guatemala. A girl or woman can use a shawl as an easy tote to carry small loads to and from the market. Often the bundle is a small sleeping baby that is held close to Mama or an older sister as they run errands, do the many tasks and chores that everyday life in the Mayan culture require, or weave on a back-strap loom. At other times, when the wind carries a chill, the shawl is easily slipped on and then off again, as the sun comes from behind a cloud or during the midlife change when body temperatures fluctuate. The shawl is also a decorative addition to the traditional huipil and corte (skirt) that many Mayan girls and women wear. 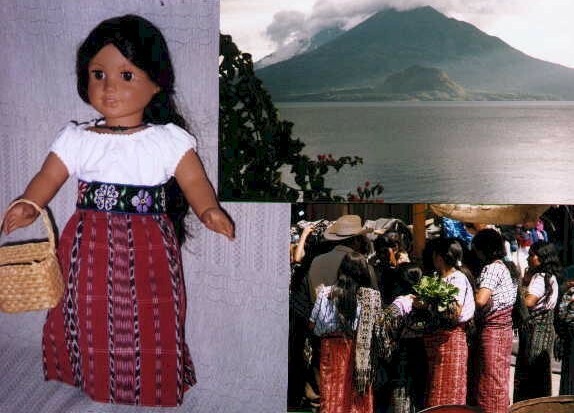 In some villages, such as Santiago Atitlan, the decorative function seems to be most important since the shawl is worn most often over the shoulder. Shawls are called rebozos or perraje (depending on the village, how they are made and who wears them). Some shawls are very distinct to the village where they are made and worn (Santiago Atitlan, Chajul, .... and others) and are usually made on a back-strap loom of cotton. Other shawls are of styles worn throughout the highlands. These are most often made on a foot-loom. They have jaspe patterns (cotton) between stripes of various solid colors (often acrylic or rayon or some mixture). Totonicapán - Usually shawls with solid color stripes and jaspe (ikat) stripes that have multifaceted doll figures (munecas), tree of life and many other symbols in the tie-tied threads. Sometimes shawls are all jaspe threads without solid stripes. Quetzaltenango -- Usually shawls with solid color stripes and jaspe (ikat) stripes that have primarily chevron designs. Totonicapán and Quetzaltenango make shawls for their own use plus make shawls in patterns and colors favored by other villages. Someday I hope there I can find better ways to identify where a shawl was made and the community for which it was made. Click on the pictures below to see a more detailed picture. Note - The pompoms on the ends of the shawls are usually made of colored yarn, some synthetic, some cotton. If you like them and one is missing its easy to replace. If you prefer the shawl without them (maybe to use as a table runner), they are usually easy to remove. Probably made in Totonicapan because of multifaceted ikat design with munecas (doll figures). Probably made in Quetzaltenango because of chevron ikat design. Bought new in Comolapa market. Probably made in Totonicapan because of multifaceted ikat design. Probably made in Quetzaltenango because of chevron ikat design. Probably made in Quetzaltenango because of chevron ikat design. Color royal purple and green. -- Probably made in Totonicapan because of multifaceted ikat design with munecas (doll figures). Small Girl's Rebozo ---- length 20", width 15"--- nice looking shawl, but moderate wear especially along one selvage edge where minus several pompoms. Probably made in Totonicapan because of multifaceted ikat design. Small Girl's Rebozo ---- length 25", width 19"--- very nice shawl (twin to above), used very good condition. Two pompom missing Probably made in Totonicapan because of multifaceted ikat design. length 42", width 21.5"--- excellent used condition. Nice salvage and fringe endings. Small Girl's Rebozo ---- length 24", width 15"--- good used condition, some spotting, minus a couple pompoms. Probably made in Totonicapan because of multifaceted ikat design. Woman's Rebozo -------- length 57", width 22"--- good used condition, slight wear along green edge of shawl. Small Girl's Rebozo ---- length 25", width 19"--- very nice shawl used very good condition, Probably made in Totonicapan because of multifaceted ikat design. Woman's Rebozo -------- length 68", width 24"--- very good used condition, Probably made in Totonicapan because of multifaceted ikat design. length 41" & fringe, width 18", good used condition. Yellow pompoms are a bit smaller than others.